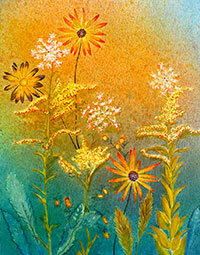 The Berkeley Arts Council announces “Summer Bloom”, a juried exhibit of art reflecting the beauty and color of summer. All 2-dimensional work framed up to 36 inches in the long dimension, including but not limited to painting, photography, and mixed media is eligible. Small 3-dimensional works that will display on a 1 foot square pedestal will be considered. The exhibit will be displayed from June 24 – July 19, 2015 in the “Back Space” at the Berkeley Art Works, 116 North Queen Street in Martinsburg, WV. There is no entry fee. Accepted artists will be asked to make a donation for each work exhibited to support the gallery at the time work is delivered. To enter, send an email with “Summer Bloom” to: bloom@berkeleyartswv.org with your name, contact information and digital images of up to three works for consideration. Digital Images should be at least 1000 pixels on the long dimension saved at 72ppi at a high quality setting. Please included your last name in the filename as in jones_no1.jpg. The deadline for submissions is June 14. Jurying will be done by a committee of Berkeley Art Works co-op artists by June 17 and work is to be delivered to the gallery between June 18 and June 21. For more information email bloom@berkeleyartswv.org or call 304-620-7277.